In this session I will have the players learn how to perform a scissor move will the pressure in coming from the front. I will also add a support in the exercise to give the attacking player more success, as well to work communication and team work in beating a defender. The players will also go through some condition games to imitate game like scenarios. The players inside the grid will pass the ball to their own color. 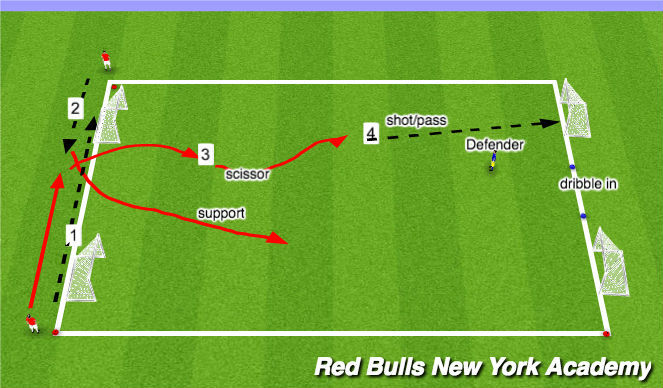 In the first part the players will do 2 touch passing working on receiving and passing with movement. 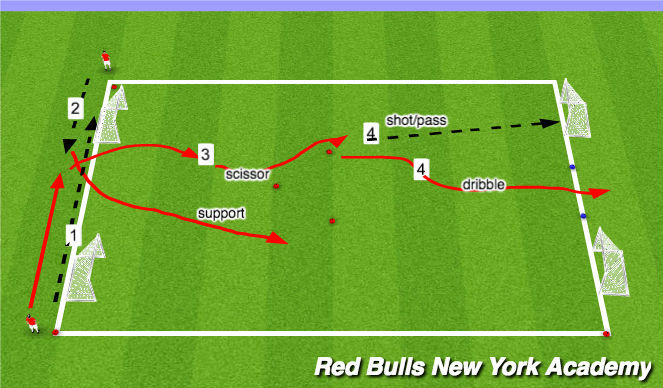 On the second part the players will do 1 touch passing to move and pass. On the last part I will have all players will a ball and dribbling with the ball at avg speed, and on my call I would increase the players tempo of dribbling. All reps will be 1:10min and 45 sec of rest. During the rest period the players will do a dynamic stretch. 2 goals with a middle gate. Two lines with even numbers. The players with the soccer balls will pass the ball to the line facing them. The receiving line will pass the ball into the space of the passer. The passer will receiving and turn the ball with either with the outside/inside and will attack the top triangle and perform a scissor move and will either shot/pass at goal or dribble with the ball into the blue gate but only have 5 seconds to get there. The other line will overlap at the same time and give support but will not be use at this moment. The overlapping line will practice run only. The set up and the exercise will be the same as the technical rep, but now we are adding a defender. The defender will come in, in front to pressure the attacking player. There will be a supporting player in the attack. Using the overlapping player will count for 1 point as well. The scoring of the game will be 1 point for pass/shot and 2 points for taking on the defender.